Home » Expat Blogs » Dominican Republic » What about your saucepans? The story of the life of an expat woman living in a Dominican barrio with her Dominican husband, step sons and an assortment of animals. 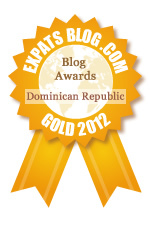 ExpatsBlog.com Expat Blog Awards 2012: Dominican Republic Gold Award! This blog won the Gold Award for best expat blog in Dominican Republic! Website Reviews » There are 32 reviews on What about your saucepans? I look forward to each new post about Chivirico. Lindsay is the best.... best mate, best writer, best survivor, best blogger. I really enjoy the way Lindsay try to reach others and how she is helping chivirico to be a excellent person. I absolutely love reading Lindsay's blog about the DR and Chivirico. She is both entertaining and educational in her writings. Whenever I see there is a new post a smile takes over my face in anticipation of what's to come. Her writings of Chivirico and his support of him have not only touched my heart but that of many others. Keep up the great work, would love to meet you someday!! I first came across What about your saucepans a couple months ago...I enjoy each and every post that is made, but mostly the post on Chivirco and his adventures. Chivirco is a very lucky little guy to have Lindsay in his life, and she to have him...But through her writings about the little guy, it has allowed many to fall in love with him and hope the best for him. I, like many can't wait for the next post! Having lived in the DR, reading her stories bring back fond and sometimes not so fond memories of my time there! I look forward to every blog from Lindsay, they make me laugh, make me sad, make me miss DR Keep up the great work!!! Lindsay writes with humour and compassion I'm often moved and entertained in equal measure by her posts. Love this blog - its one of the few i religiously read. Laugh and cry in equal measure and love following the story of the security guard! a wonderful blog written with humanity and humour - highly recommended! "Laughter through tears" is probably the phrase I would use to describe Lindsays blog. A REAL look into the heart of life in the DR far away from the illusion from resorts and popular residential areas for expats. Her sense of humor is second to none and probably her secret for surviving and embracing the DR culture. Saucepans blog is an excellent blend of humour, humility and education. This blog is an excellent veiw into barrio life in a third world country. Always an enjoyable read. I love reading the stories that Lindsay shares with us. She is so talented at making the people come alive and helping us to connect to Chivirico and whoever she writes about. It is a fascinating country and a pleasure to continue learning new things as I read her blogs! Lindsay is a wonderful and dear friend, and her blog is so entertaining and educational at the same time. Having had the privilege of livIng near her a few years ago, and visiting her now whenever possible, I can say that her stories are absolutely true, as I have witnessed some of them! She is funny, real, and engaging, and she absolutely gets my vote!! By far the best blog for this region...is there a 10 star option? Great Blog! Love Lindsay's relationship with Chivirico and also love the way she shows the DR. I can't believe I only just discovered this blog! It is witty and engaging, bittersweet and exhilerating and I just plain love it. I've visited the Dominican many times and plan to "retire" in Las Terrenas as soon as possible. Keep these wonderful posts coming!!! Lindsay is a wonderful writer! I love reading her blogs on the DR, they are always informative and hilarious! Lindsay is an amazing person and talks about real life in the DR. I enjoy her blog. I thoroughly enjoyed Lindsay's A to Z of the Dominican Republic, a country a knew nothing about until I started reading her posts. A brilliant blog by an amazing woman. I love reading Lindsay's Blog its so funny and serious at the same time, It has been my pleasure to spend some time with Lindsay a couple years back, she is one amazing lady!! I always enjoy reading Linday's blog, she tells it like it is, however mad, sad or bad. It brings back fond and not so fond memories! Definitely a a winning blog for sure. I absolutely love your blog. One suggestion is that you add a link to your first post. Today I have gone back through all posts containing Chivirico. As the mother of 4 sons I treassure posts about this darling little boy. My computer is at the computer doctor and I am using my old 4 computer away relic. It gets me around, but creaks a lot. Kath in Canada (came from England almost 50 years ago.